During this time the way Facebook Pages have operated has changed too. When they first launched in 2007 Facebook Page Admins could expect their posts to reach almost all of their fans. But as the number of Pages and amount of content being shared has increased, this organic reach has declined. By 2012 Facebook Page posts could be expected to reach on average 16% of fans, by early 2014 this had dropped to 6.5% and by early 2016 it was below 2%, as detailed here. There are many reasons behind this, from algorithmic changes to Facebook’s News Feed, to the increase in content being shared on the platform. But the upshot is that it presents a challenge to Facebook Page Admins. In this blog we’ll be covering six ways you can fight this decline in organic reach to maximize the visibility of your Facebook posts in your fans’ News Feeds. The Facebook News Feed algorithm is complex, constantly changing and takes into account thousands of data points to choose what content is surfaced to users. We’re not going to dive into an in-depth analysis of the algorithm here, but we will briefly touch on what the News Feed algorithm is meant to do. This may seem like unhelpful advice: “Facebook wants to surface engaging content, so create engaging content.” But by this we mean understand what your most successful content is and focus your resources on creating more of this. Utilize Facebook Page Insights to find out which of your posts get the most reach, clicks and engagement, what types of posts these are, whether they are geo-targeted, what time they are posted and so on. You can also monitor your competitor’s Pages in the “Pages To Watch” section and view lists of the most engaging posts on these Pages. There’s a lot of resources at your fingertips in Page Insights, use them to understand what your most engaging content is and help these insights inform your future content plan. Don’t be afraid to reduce the number of times you are posting to your Facebook Page—it’s worked for some brands. A good rule here is to focus on quality over quantity, provide your fans with something truly valuable and it’ll resonate. Facebook is surfacing more video content than ever, so try creating and sharing more videos. It will take more resources than a simple image and text post, but your engagement will likely soar. See our tips for improving your Facebook video marketing strategy for more help. Facebook has two Audience Optimization Tools for organic page posts: Preferred Audiences and Audience Restrictions. You can use both of them whenever you share something on your Facebook Page. Facebook’s Preferred Audience feature allows you to add keyword interest tags to your post (similarly to how you would with an advertising campaign) to help Facebook understand what your post is about and who it may be of interest to. It may seem counterintuitive to restrict the potential reach of you post in order to increase its reach, but by restricting your post reach to only relevant users, your engagement rate will likely increase. This increase in engagement rate will signal to Facebook you have interesting content and will encourage it to show this content to more users. 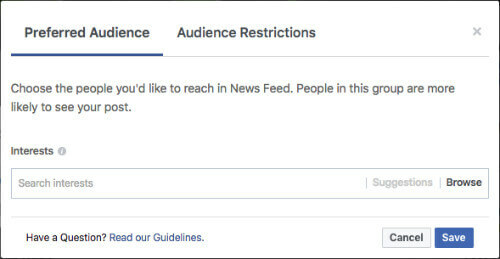 You can even add Audience Restrictions to explicitly tell Facebook to restrict the reach of your post to certain age groups, genders, locations or languages. As with Preferred Audiences, narrowing your potential audience to the most relevant segments will ultimately help you increase engagement rates and, thereafter, foster more reach. For instructions on how to get started with Preferred Audiences and Audience Restrictions read more on Facebook. You don’t want to spam people, but if you recognize people who regularly engage with your content here’s your chance to secure them as a Page fan. As with any kind of digital marketing, you have a wealth of data at your fingertips—so test, test, test! Experiment with what you post (images, videos, albums, live video, length of text etc), when you do it and how you target it. Find out what works for your specific fan base and then do more of it. You can tag relevant Facebook Pages within your own post and anyone who likes the tagged Page will potentially see your post. If you work with other brands or are sharing another Page’s content then this is a great way to increase your potential reach. If you want to dramatically increase your Facebook post’s reach then the best option is to use paid advertising. You can spend as little or as much as you want and this gives you the ability to reach people beyond those who like your Facebook Page. But there’s a couple of things you need to be aware of—it’s important not to click the “Boost Post” button on your Facebook post but actually create a properly segmented Facebook Ad Campaign. This allows you far more control over audience targeting, ad placement, bidding and more. The great thing about post promotions is that, as a secondary result, they also tend to drive a lot of new Page Likes as well as increasing your organic reach by displaying your post to the connections of people who engage with it. You can easily create Post Promotion campaigns in Adgo that will be optimized towards delivering your promoted post to people who are most likely to engage with it. Despite the decline in organic Page reach, people are consuming more content than ever on Facebook. The competition for their attention is just heating up and Facebook’s algorithm is adapting to this. What does this mean for Facebook Page Admins? You’re in a battle with rival Pages and your fans’ friends and family for their attention. You’ve got to say relevant. As with so many other forms of marketing you need to create engaging content, use all the data at your fingertips to understand what works, utilize Facebook features to increase your engagement and throw some advertising spend into the mix to increase your reach. Older PostWhat’s The Difference Between CPM and CPC?